Often, even after adjusting Levels and Panning, different tracks with similar frequency content (for example, a bass guitar and a kick drum) may be difficult to tell apart in the Mix. A good tool to address this issue is an Equalizer (or EQ). Essentially, an equalizer allows you to separately control the gain of different frequency ranges of a sound. This can be useful not only to sculpt the timbre of an isolated sound (for example, to make it sound 'sharper' or 'smoother'), but also to make sounds of various timbres to integrate better into the Mix. The simplest kind of Equalizer is the one familiar to us from analog mixers. It has three parameters, which adjust the Levels of three Bands, or frequency ranges: one for the Bass (low frequencies), one for the middle range frequencies and one for the Treble (high frequencies). The "DJ EQ" LADSPA Plugin is just such an EQ. A more complex Multi-Band (or Graphical) Equalizer often has between eight and thirty-two Bands. Each Band is centered on a frequency, and the Level of each Band can be independently adjusted. In some Multi-Band EQs, such as the "TAP Equalizer" LADSPA Plugin shown below, the center frequency of each Band can be defined by the user. This allows you to either attenuate (or remove) an unwanted frequency, or to reinforce (boost) a desired one. The overall "curve" of the Bands can also be used to determine the general tone of your Track or Mix. In the example above, the lower part of the mid-range frequencies have been "scooped out" a bit (note how Bands 1 and 8 are left untouched at 0 dB, while intermediary Bands 2 to 7 draw an attenuation curve, with Band 4 at -13 dB as the lowest point). The Parametric Equalizer is the most versatile type of EQ used for Mixing because of its extensive control over all types of EQ parameters. In Ardour there is a Parametric Equalizer called the "Triple Band Parametric with Shelves", located in the Plugin folder labeled "Steve Harris". There are three options for each Frequency Band. 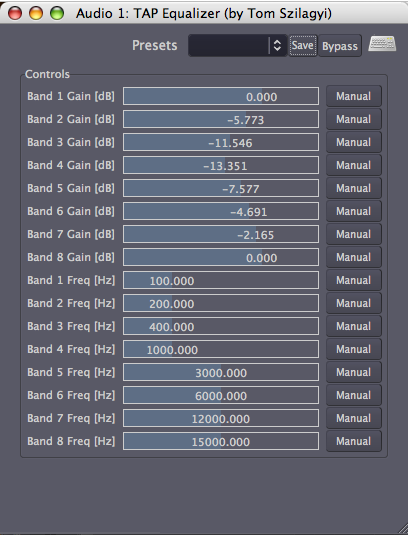 Each of the three Bands has a "gain (dB)" adjustment to cut or boost frequencies, a "frequency (Hz)" adjustment to select center frequency, and a "bandwidth (octaves)" slider which determines how wide the range of frequencies to be affected will be. This plugin also contains a High Shelf and Low Shelf. A Shelf cuts or boosts everything above (High Shelf) or below (Low Shelf) a specific frequency. For example, a Low Shelf can be used to remove unwanted rumbling sounds, and a High Shelf can be used to reduce hiss. In order to achieve a better separation of two instruments in the Mix through the use of EQ, you first need to find out where the two instruments overlap. Here's one approach. 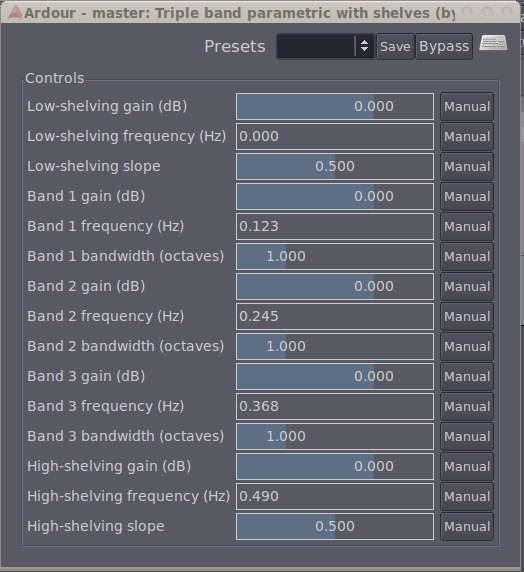 In the Triple Band Parametric with Shelves Plugin, select an appropriate Band for one of the instruments. In the case of a bass guitar, it would be "Band 1", the low frequency band. Boost the "gain" to 10dB, increase the "bandwidth" so that is a narrower range up to 3, and then scroll the "frequency" up and down slowly. You'll hear a pitch move up and down. Then scroll it down slowly until you hear the frequency range where the two instruments overlap. Now simply reduce the "gain" to -5dB, and you will hopefully hear the instruments a bit clearer. Next, apply the same process to the other instrument. There are many approaches to EQ. Hopefully this will provide one example of how to begin EQ'ing Tracks in your Mix. But most importantly, when it comes to EQ, it is better to use too little than too much, unless you're consciously using extreme EQ as a compositional parameter. You should have enough tools now to create a clean, well-balanced Stereo Mix of your Session. However, if you want the parameters of your Faders, Panning or Plugins to change over Time, then you will want to explore the Using Automation chapter next. If not, then skip ahead to learn how to Export Sessions in the following section.